Posted October 8, 2011, in News. Having moved our case tracking system to Fogbugz on-demand, one of our favorite features is its reporting function. You can see the current activity of Movable Type development with a variety of graphs and charts. I would like to introduce some of the highlights here. 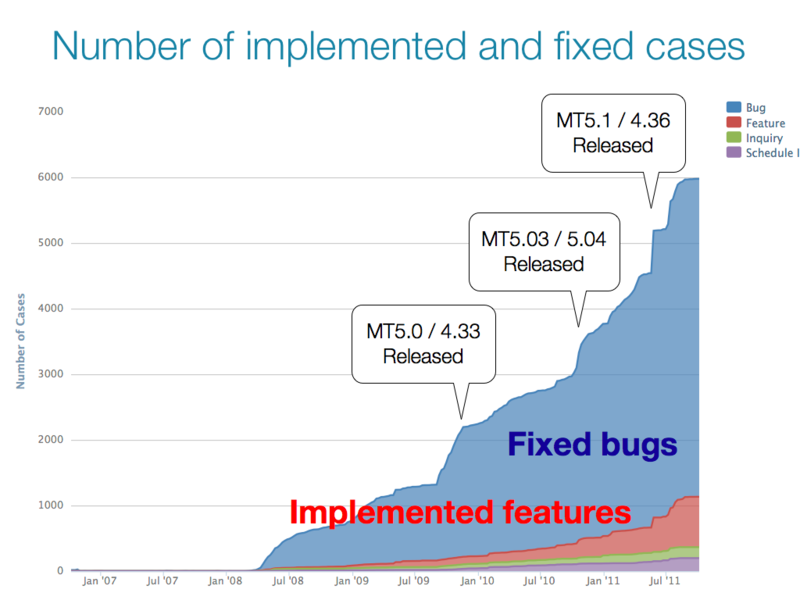 The following graph shows numbers of fixed bugs and implemented features since 2007 when we started to use Fogbugz. As you can see, it is more active than ever. I should also mention that this achievement includes a lot of contributions from the community which is also shown in the long list of the acknowledgments in 5.1 release notes. You can check the live status if you have an account. If you don't, you can create an account to report a bug or send a feature request. You might wonder how the submitted cases are handled. The development team is reviewing new cases on every Thursday. And periodically we conduct "a big triage" to sweep remaining cases. 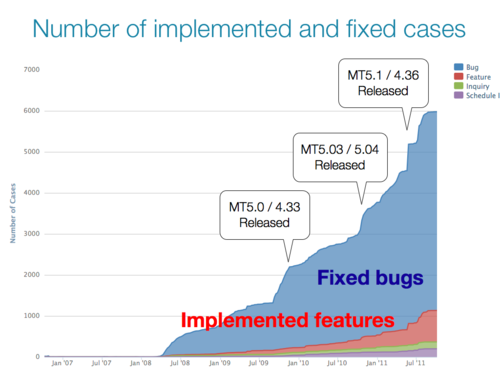 The following graph shows the improvement in our product management. Now all the feature request cases have been reviewed and categorized in this product backlog page. October is a special month for Movable Type. And especially this year, it is the 10th anniversary since it was born in 2001. Thank you for your continual support. We hope to be a further exciting platform for you to enjoy. I have use mt 9 years in Taiwan. You guy did a great job! Congratulations on some very effective charts. They speak volumes about why people should be switching to MT 5.1. 10 years! Congratulations. Happy Birthday!!! 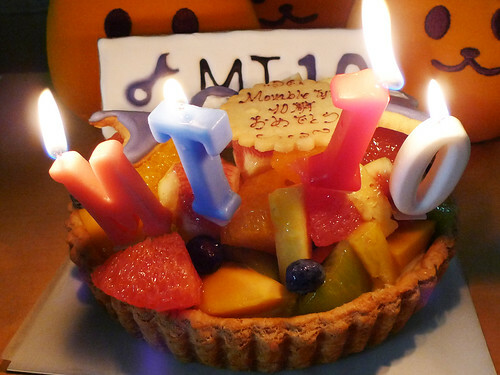 Wow, happy birthday MT ! Hope Movabletype continue again and again ! Wow, just joined today and this is what will embrace me! Happy birthday!!! I know is a bit late but as they say better late than never. Very good statistics and well done job :) Well done team! Nice charts, Very good statistics. So amazing ! Advance Happy 11th Anniversary this coming October. Wish you more strong and productive years to come. Happy anniversery guys! Keep up the good work! Wish you many more years of such a good work for future development of MT. I agree, the progress is amazing. Happy birthday guys! For alphabetic scripts, movable-type page setting was quicker and more durable than woodblock printing. The metal type pieces were more durable and the lettering was more uniform, leading to typography and fonts. Congratulation for your work and your longevity and I hope we’ll see more improvement in ten years ! i am roshan mahanama from Orissa. Please read the the content of the site and understand it meaning. It will help u and other as well. They are are making jok but when i had read. It was was meaningful and useful post which was very good. Well I know I am almost a year late to wish MT 10th Anniversary. The reason is, I am new to this site and the status has really impressed me. Hello Everyone! I don’t really know much about MoveableType. Is a contact managment system (something like wordpress) or what? Anyway, very impressive status, please answer my question right here on this page. Thanks in advance. Wow, amazing statistic. A lots of work you have done here on improving the source. I liked the article of Jun Kaneko on the topic of Status of Movable Type development.Thanku. Grateful to check out your website, I seem to be ahead to more excellent content and I believe we all really like to thank for so many excellent content,weblog to discuss with us. You may have found on your epidermis that going kind v5.x didn’t support On the internet Visitor 9 as well as the latest versions of Firefox and Safari. Going Type v5.13 is now appropriate with all these web web web online web browser. I am a new user of this site so here i saw multiple articles and posts posted by this site,I concerned more interest in some of them hope you will give more information on this topics in your adjacent articles. Hope Movable type will have more 10 years.